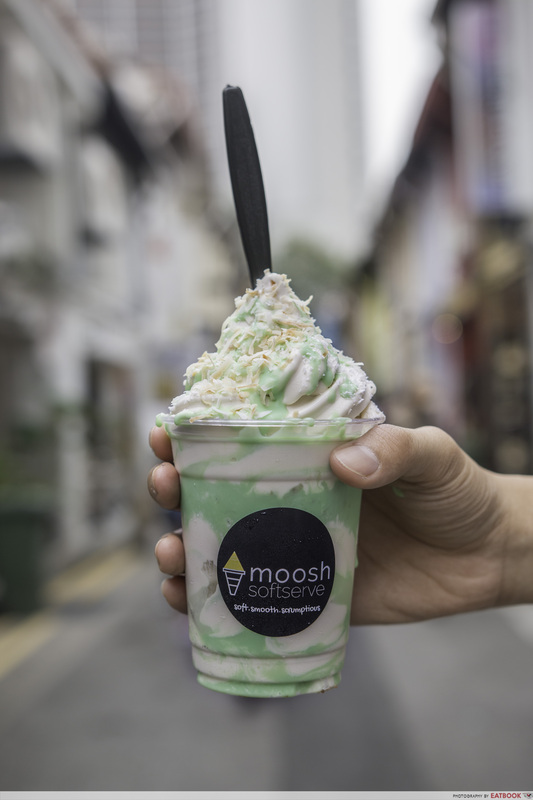 Many dessert eateries have been popping up at Haji Lane lately and one of them is Moosh, which made its debut in the hipster street earlier this month. 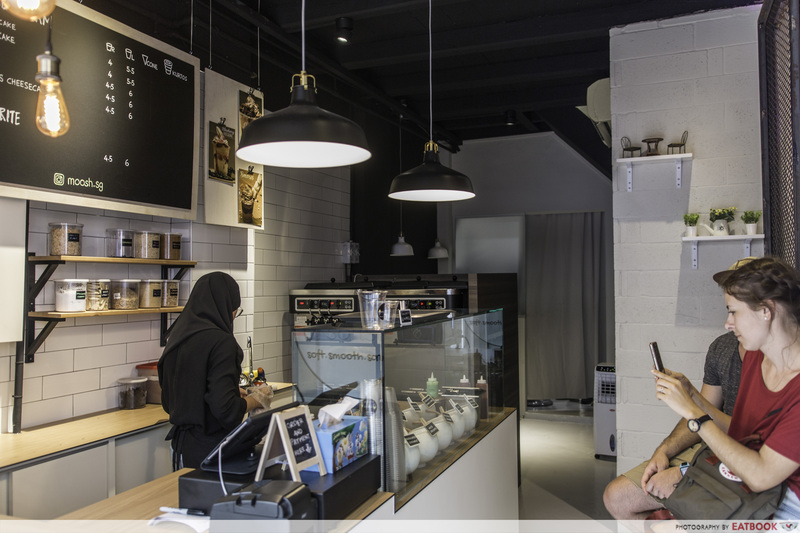 Similar to Overrun, this new store specialises in soft serves – unique ones at that. As a guy who’s constantly craving for sweets, I couldn’t help but head down to try it for myself! With the heat returning from its short hiatus, we ordered their Ondeh-Ondeh ($4.50 for small, $6 for large). There’s something about watching soft serve being swirled into the cup which calms my heart. I felt like a kid again looking through the glass panel as a staff member deftly prepared my order. Green pandan sauce was drizzled on the sides of the cup and on the soft serve. 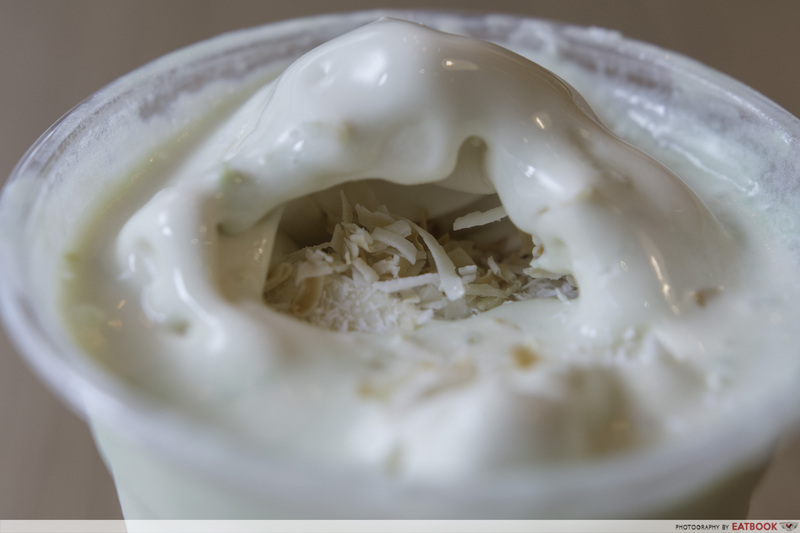 To top it off, it was garnished with both coconut chips and toasted coconut shavings. Of course we had to feed the camera first before feeding ourselves. The substantial soft serve was silky and smooth, with a subtle sweetness from the gula melaka soft serve. The pandan sauce added fragrance and aromatic notes which went really well with the soft serve. As I dug deeper into my cup, I was surprised by the layers of dried coconut sandwiched between the soft serve. The fibrous texture of the coconut made it feel like I was actually having an ondeh-ondeh. We also had Strawberry Cheesecake ($4 for small, $5.50 for large). 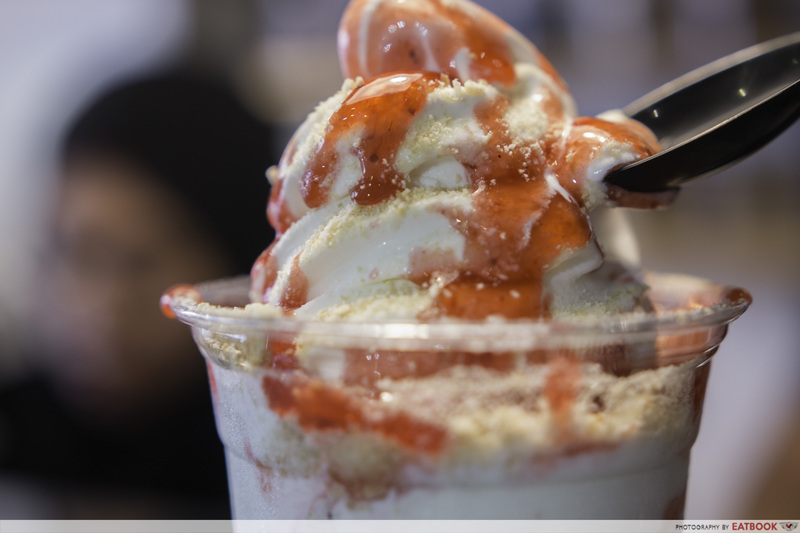 The deep red strawberry sauce contrasted with the pale soft serve, creating swirls of colours. As a cheese lover, I was looking forward to it but, to my disappointment, I couldn’t find any chunks of cheesecake in my cup. I realised that I was too quick to judge; I scooped a spoonful into my mouth, only to be surprised by how the cheesecake was actually the soft serve flavour. It melted almost immediately upon contact with my tongue, leaving trails of mild savouriness of the cheesecake soft serve on my taste buds. The sweet and tart strawberry sauce complemented the soft serve well, though they could reduce the sweetness by a bit. 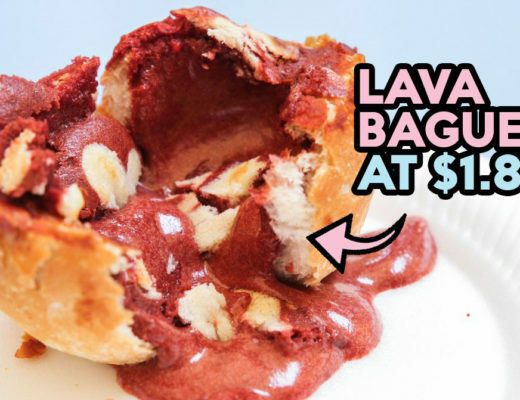 There was a play on textures; the viscous sauce matched the smooth and creamy soft serve with crumbs of crushed Marie biscuits adding a gritty crunch. Needless to say, we couldn’t give their Nutella Brownies Cheesecake ($4.50 for small, $6 for large) a miss because there is always space and time for Nutella. 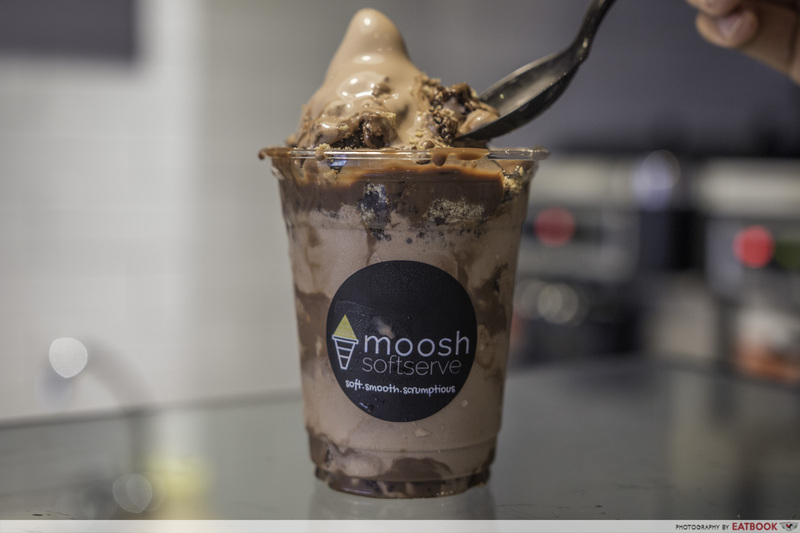 The cup was filled with layers of Nutella soft serve, chocolate malt, digestive biscuits, brownie crumbs, and drizzled with chocolate sauce. Just like the previous cups, the soft serve melted quite fast. I’m not a big fan of their brownie crumbs but the soft serve compensated for what the toppings lacked. The soft serve had a hint of hazelnut which I really liked and it wasn’t as chocolatey as I thought it would be, but still sweet enough to hit the all the right spots. However, what confuses both my colleague and I till today is that there wasn’t any cheesecake flavour in this. Moosh adopts a minimalist concept; incorporating white-tiled walls, black decor, and processed woods together with orange tungsten light bulbs. 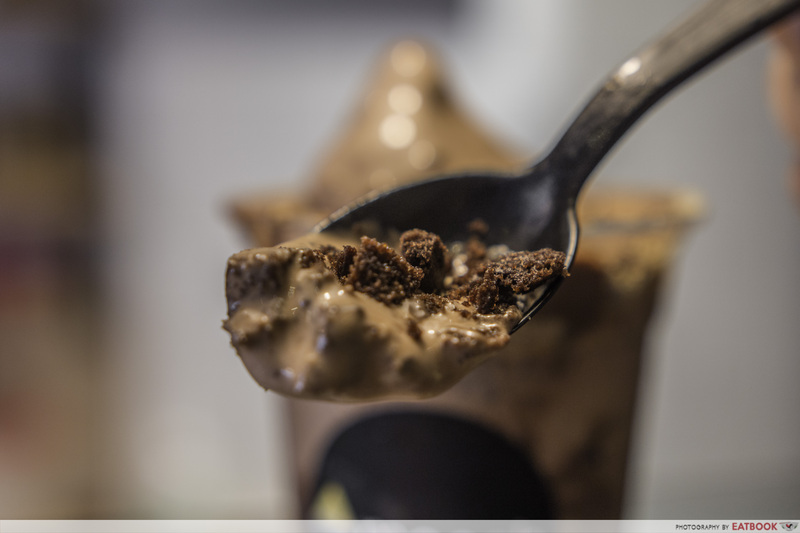 Sit on their tall bar stools while enjoying your soft serve, away from the blazing afternoon heat. With their counter occupying the most space in the store, there isn’t much free area for tables. 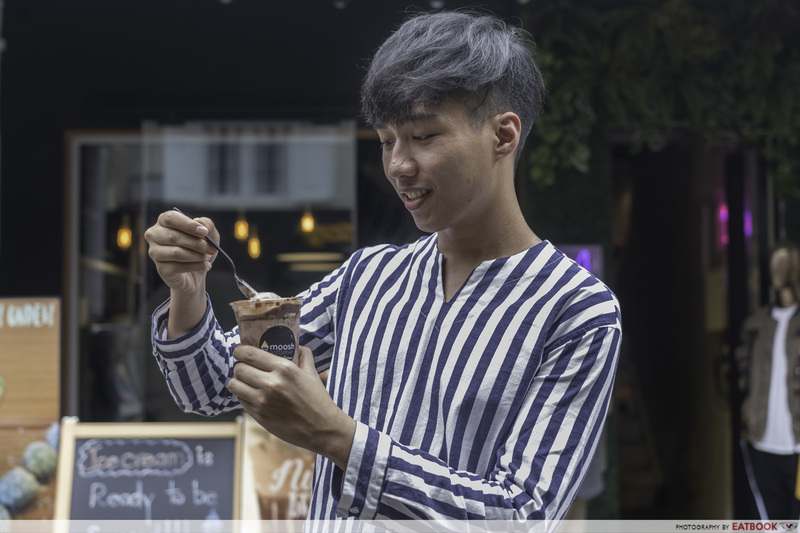 But that shouldn’t be a problem as their soft serve cups are a great buy-and-go dessert to have while exploring Haji Lane with your friends. 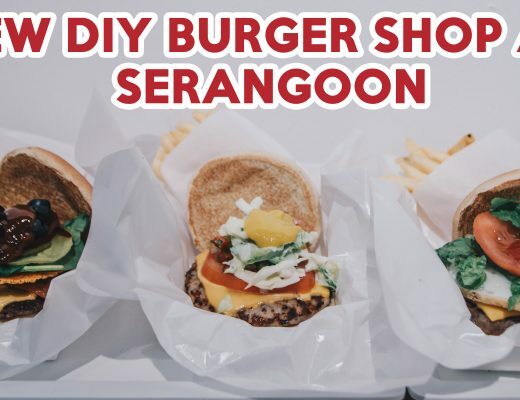 With trendy shops and eateries constantly opening up in Bugis, this ever-changing spot once again proves to be a popular place to both locals and foreigners. 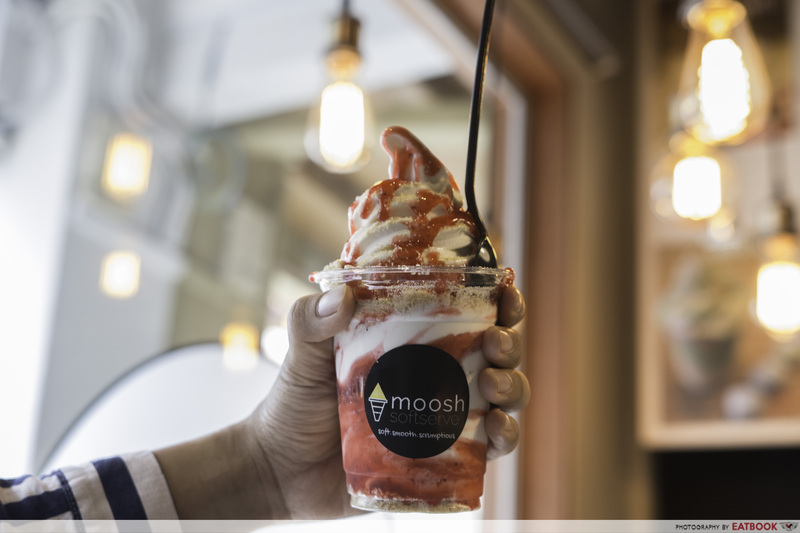 I would definitely recommend Moosh to everyone if you’re around the area. 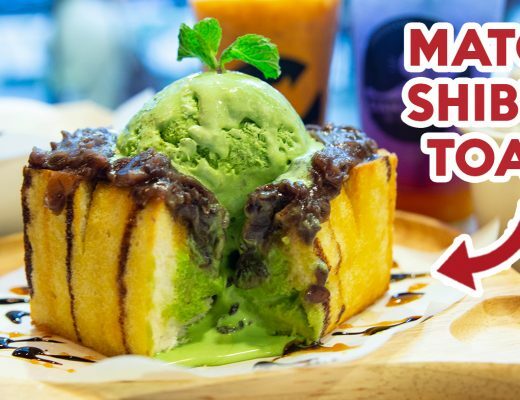 Besides its value-for-money soft serves, they also have kurtos – chimney cakes – which will be available in February. Do leave a comment down below if you’ve tried the soft serves here and let us know which flavour was your favourite! 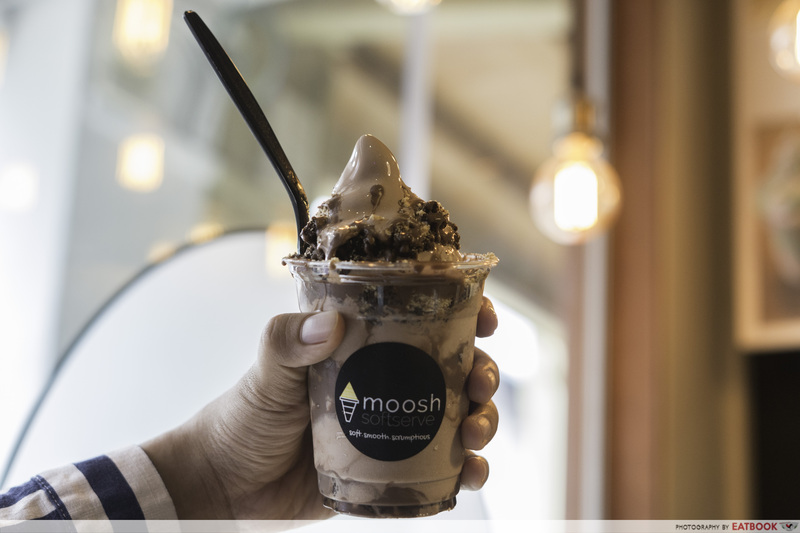 Moosh is a Muslim-owned eatery.